For their Kingdom Come series, Mark Waid and Alex Ross put DC's old heroes in a dark future. For some, it was a complete reimagining, rebuilding the character from the ground up. For others, all that was required was to take what was already there and push it to an unexpected, yet logical, extreme. In a world where super-humans have withdrawn from the public eye, Aquaman is unconcerned with those on land, being the ruler of the vast underwater kingdom. Aquaman, Arthur Curry, has always been known as the Monarch of the Seas, but until the late Silver Age, that title was mostly honorary - the notion that he was actually king was a late addition to his mythos. It really caught on, however, and even through several reboots over the years, his kingship has been a constant factor - even when he had no subjects to rule. Kingdom Come played that up, painting Aquaman as a truly regal figure. He ruled Atlantis with Dolphin as his queen - an idea that pre-dated the two having a relationship in the monthly comics. Taking advantage of the fact that Aquaman was now rightly King Arthur, Ross designed him with a classic middle ages look. 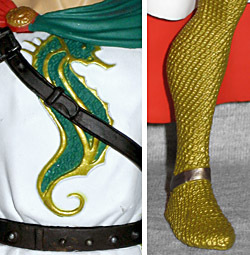 He's wearing a full suit of golden chain mail beneath a white tabard and a red and green cloak. His crown is a simple band with a seashell on the forehead, and his hair and beard are graying, but still have hints of their original blonde. Karen Palinko did a great job on the sculpt of this figure. She really captured the look of Alex Ross' artwork, so Aquaman won't look out of place next to the KC figures Tim Bruckner sculpted. The tiny rings of Aq's armor are incredibly detailed, and the wrinkles on the cloth are subtle. The seahorse on his chest - a cute nod to both medieval heraldry and Arthur's old mode of transportation - is a raised element, with a scale pattern in the center. Aquaman has two accessories, a 4" sword and a 9⅜" staff. Either can be held in his left hand, and the sword fits in a scabbard hanging near his left hip. The staff, a gold trident with an octopus curled near the top, isn't sized for the hand to hold it securely, and it's very flimsy - neither of which is a good thing. It looks nice, but it definitely could have been better made. The figure's left arm is posed to accommodate the trident, so there's not much you can do with the sword. Articulation doesn't help any, either - he moves at the neck, shoulders, wrists, waist and hips, and all eight joints are plain swivels. Very disappointing. They could have at least put balljoints in his shoulders, since they're covered by the cape. But articulation has never been DC Direct's strong suit, has it? DCD is never known for its great articulation, and they're even more averse to movement for their Kingdom Come toys. It's a shame, really, because this is the best Aquaman has ever looked. The King Arthur thing works for him, much better than the orange and green pajamas ever did. It's very iconic, but playability is crap - especially since his main accessory barely works. If he had some articulation, he'd be a must-buy. Right now he's just one for the folks who like the look.